How to take screenshot on Samsung Galaxy S5 without using any apps? How to access the developer options on Samsung Galaxy S5? How to access the hardware menu button? How to use kids mode? How to customize Galaxy S5 ringtones and notification tones? How to use Galaxy S5 Samsung keyboard? How to change Galaxy S5 language? How to turn off My Magazine on Galaxy S5? How to turn on (or off) SMS and MMS message preview on Galaxy S5? How to use Galaxy S5 safety assistance? How to silence Galaxy S5? How to use Galaxy S5 finger scanner? How to boot Galaxy S5 into safe mode? How to use Galaxy S5 safe mode to exit kids mode? How to use Galaxy S5 screen mirroring? How to access and use Galaxy S5 notification panel? How to access and use Galaxy S5 quick settings panel? How to customize Galaxy S5 camera shortcuts menu? How to add widgets to Galaxy S5 home screen? How to use Galaxy S5 camera to take photos continuously without reviewing photos taken in Gallery app? How to disable app notifications on Galaxy S5? How to use app folders in Galaxy S5 home screen? How to manage Galaxy S5 home screen panels? How to use Galaxy S5 camera voice control? How to use Galaxy S5 camera effects? How to set Galaxy S5 photo size and video size? How to save photos to SD card on Galaxy S5? How to use volume button to take photos in Galaxy S5? Will Galaxy S5 use curved screen (flexible display)? As the releasing date for Galaxy S5 is closing, more and more rumors are circulating around. Just like any other hi-tech products, some rumors are proven to be correct eventually, because technology is predictable. For such rumors, you my check our live post on latest Galaxy S5 rumors. One of the most important aspects of today’s smartphone is the display. A vivid screen is essential for the success of flagship smartphones. Samsung does have an edge over other smartphone manufacturers on the smartphone screen, due to its dominance in OLED technology. Although there are some critics on OLED display on its over-saturated colors (i.e., unnatural), most consumers still enjoy the vivid color it provides. Samsung has never been shy on putting OLED panels on almost all flagship smartphones. The question that bugs many geeks is whether Samsung will use curved display for Galaxy S5. Is flexible display for smartphone new? Flexible display is not new. But using it on smartphones is just starting. Samsung claimed the title of the first smartphone with a curved screen (flexible display) in early October. However, Galaxy Round is available in very limited regions. And it is not well-polished. For Samsung, claiming the title is more important than fine tuning the product. LG G Flex probably is better tuned with the curved screen. 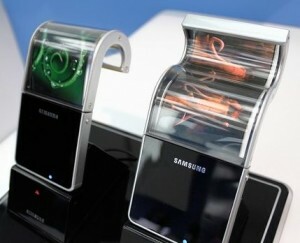 Now Samsung has time to catch-up in using flexible display on smartphones. Samsung is good at following, not at leading. Galaxy Round is an example; Galaxy Gear is another example. Although Samsung has the technology, and may have the yielding capacity in the factory as well, but very unlikely Samsung will use flexible display in Galaxy S5 for following 3 reasons. Changing from flat screen to a curved screen is not an incremental iteration. To benefit from the flexible display, re-invention of smartphone is needed. Otherwise, most users will not see the need for such a crived screen. Galaxy Round is just one experiment for Samsung to test curved screens. It is a Galaxy Note 3 without S Pen. It is an enlarged Galaxy S4 with curved display. Essentially, Samsung has no idea how the flexible display should be used. LG G Flex uses the curved screen to address the durability issues (with the help of the flexible back cover). But it apparently distorts the content noticeably. So, Samsung will continue to experiment flexible display on more sizes. But they will use it on mainstream products only when someone else comes out with a revolutionary idea. Samsung is now unarguably the king of Android phone. They are comfortably enjoying the success of Galaxy S series. How to change screen resolution of Galaxy S7 and S7 after Android Nougat update? How to use screen zoom to adjust the size of icons, notifications, and lock screen keypads in Android Nougat update for Galaxy S7 and S7 edge? How to disable multi window in Samsung Galaxy S6, S6 edge and S6 edge+? Disclaimer: Samsung, Galaxy, Galaxy S5 are trademarks of Samsung . This website is NOT affiliated with Samsung in any way. All the information provided on this website is provided on an "as is" and "as available" basis and you agree that you use such information entirely at your own risk.